McCoy departs USC after spending several weeks enrolled as a student. After signing with USC in early January, heralded five-star recruit Bru McCoy is leaving the Trojans. The wide receiver will depart USC after enrolling this spring and will transfer to the University of Texas, per reports. On Friday, McCoy signed a financial aid agreement with Texas, per multiple reports. 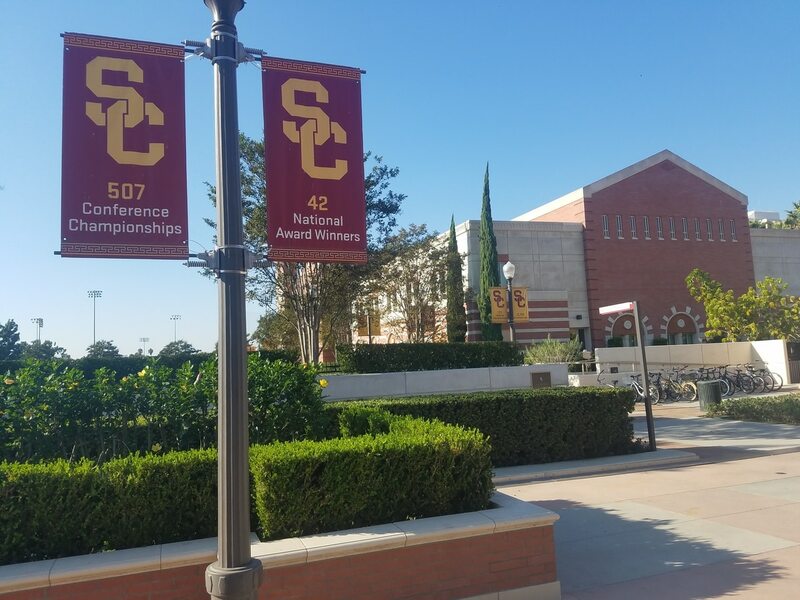 Previously, McCoy entered the NCAA transfer portal after spending a little over a dozen days as an enrolled student at USC. He will now need to be officially released to complete the process, per The Athletic's Bruce Feldman. The move follows Kliff Kingsbury departure as USC's offensive coordinator. Kingsbury, who spent a little over the month on the job, left to become the head coach of the NFL's Arizona Cardinals. USC has not found Kingsbury's replacement. Prior to joining USC McCoy, a Mater Dei alumni, fielded multiple Divison-I offers including UCLA, Alabama and Michigan among others. McCoy announced his decision to enroll at USC during the 2019 Army All-American bowl game. Several days later, McCoy along with several other members of the 2019 recruiting class enrolled in USC for the spring semester. McCoy has been ranked by 247Sports as the No. 1 athlete in the nation, the No. 2 player in California and the No. 9 player nationally in his class. While McCoy's intentions are not known, it may have much to do with USC lacking an offensive coordinator. It is not known when USC will make a hire, but it is important to note that National Signing Day is on Feb. 6 and the team will commence spring practices in late March. USC would ideally like to have someone in place before those days. Had McCoy stayed at USC, he would have joined an elite wide receiver unit that boasts senior Michael Pittman Jr., redshirt junior Tyer Vaughns and sophomore standout Amon-Ra St. Brown. McCoy's inclusion would have provided another offensive weapon for second-year quarterback JT Daniels. Prior to McCoy's transfer, USC boasted the No. 14 ranked class in the nation per 247Sports. USC's 2019 class, which also includes tight end Jude Wolfe and offensive tackle Jason Rodriguez, was only second to Oregon in Pac-12 rankings. McCoy's transfer will boost Texas to No. 3 nationally in 247Sports class rankings. It remains to be seen where USC will fall without McCoy. USC still has hard commits from receivers Kyle Ford and Puka Nacua. The two have not signed a letter of commitment and will likely do so on National Signing Day. Nacua was named Offensive MVP during the Polynesian Bowl earlier this week. McCoy's departure to Texas adds another hitch to USC's storied rivalry with the Longhorns. In 2005, the Trojans lost the National Championship to the Longhorns. The two teams met over a decade later in 2017, when the Trojans bested the Longhorns at home in double overtime. The Longhorns beat USC in their 2018 matchup, 37-14. The two teams are not expected to play in upcoming seasons. In the meantime, USC will look to secure its final recruits to fill out the 2019 class. The team will also continue to search for an offensive coordinator. USC Annenberg Media will continue to provide updates on both searches.